somehow, my mom gets involved with almost every church event in temecula. maybe that is exaggerating a bit, but it really feels like it. it's her own fault too. if she weren't so multi-talented she would be used much less. she started out making dinners for the masses, but now has gotten in to the decorating side of things. 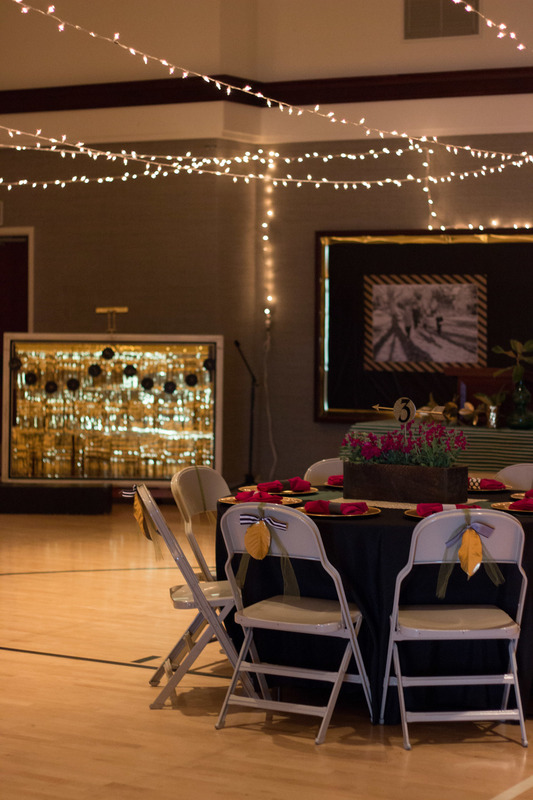 for those of you who are lds, you know how hard it is to hide the 'cultural hall' with cute decorations. there is lots of space that needs to be filled, high ceilings that need to be dealt with, ugly walls and dividers and ugly chairs and tables. this is how we did it. this is the view from the entry facing forward. we made the tables in to an 'x' formation (we had nine total). we strung lights across the top (which would have looked tons better had they been globe lights). there were two large bulletin board-y spaces we have to deal with. we used 99 cent black table cloths and cheap gold ribbon to frame them. then we printed engineer size family pictures (because the event was about families). we backed them with wrapping paper. (i don't have a great picture of these but you can see them on the back wall). we put our big white frame in front of the piano and filled it with gold fringe. for the tables we rented black table cloths, gold rimmed plates, and raspberry colors napkins. we used our gold chargers (seen here) and wood boxes (seen here). we bought emerald green runners from ikea and added in our cute west elm gold napkins. 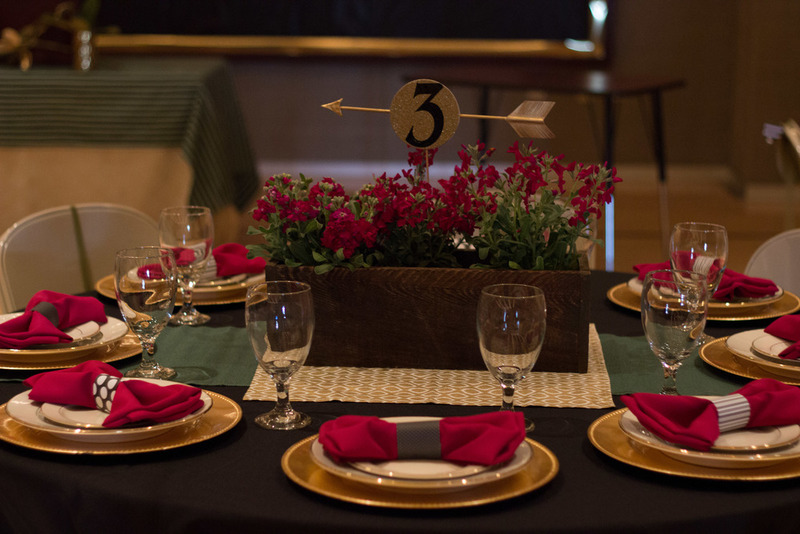 we filled the boxes with raspberry colored stock and made table numbers using arrows and coasters. we made bow-tie napkins using black patterned papers. on the chairs we tied gold sprayed magnolia leaves with green tulle and a little black and white striped ribbon. we also created a cute sitting area with furniture from my mom's house (very bottom picture).